It’s not that The Lobster is particularly difficult to crack—it’s that there just may not be enough meat inside once you do. It’s the kind of film that’s expected from Yorgos Lanthimos, the cinematically unkind filmmaker who brought us 2009’s Dogtooth. Lanthimos’ tendencies are to subvert the norm and to make you squirm, and in his Competition debut he succeeds in a number of ways. So if that’s what The Lobster is pinching at, then so be it—but be wary if this film is touted as something deeper than the shallow bisque it stews in. 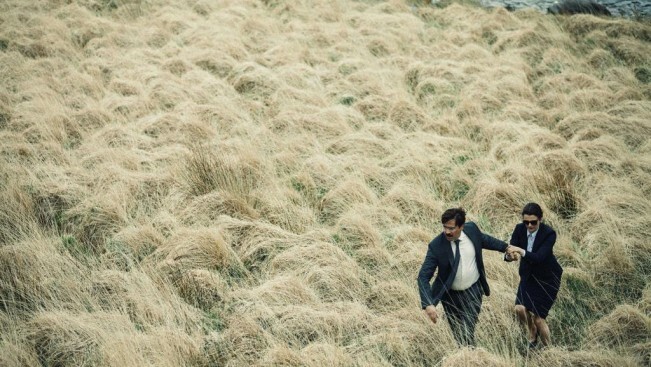 The premise—hell, the logline—is enough to pack the Lumière to the gills at 8:30 AM, because The Lobster is a real beast of an idea: in an alternate dystopia, men and women who remain Alone (capital A) are eventually sentenced to be transformed into an animal, mostly of their choosing, if they can’t find a mate in time. We’re centered around David (Colin Farrell), a man with a flat personality who joins a “hotel” complete with seminars and junior high dances to encourage romantic encounters—or fake them entirely. There are some laughs here, and definitely a couple grins. Like when asked what animal he would want to become if he fails to find a partner, David replies with the title of the film, and moments like these the script is winking at its most apparent. But the crustacean as a visual image is a motif that’s expressed a little too enthusiastically for it to be nuanced or subtle, and when the film leaves its shell and enters a third act where we meet a rebellious Léa Seydoux and our mysterious narrator (Rachel Weisz), the off-putting brine comes to a boil. The film mostly falls apart. In fact, it’s the austerity and punishment of Lanthimos’ black comedy or dark drama that is too cute and bizarre for its own good. It’s entertaining and brow-raising for about the same amount of time as the premise holds. The result: an exercise in alienating an audience, with an ending that is eager to isolate the squeamish in the crowd and laugh at them. Mission accomplished. I reject the idea that the last thirty minutes are too strange for me, or that I missed the point. (Realistically, I don’t think anything is stranger than the film’s initial hook.) It’s that it becomes visually dull and excruciatingly awkward in a way that isn’t as clever as Lanthimos thinks it is. I read not a week ago that many chefs believe stunning or attempting to stab a lobster while you’re cooking it will release chemicals that ruins the taste. Maybe, in the writing phase somewhere, something similar happened: this auteur had a live one, but in wrestling it to the screen, the meat somehow became spoiled.